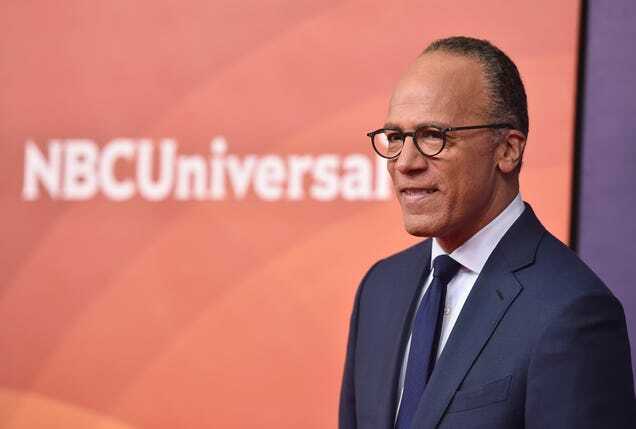 Newscaster Lester Holt attends NBCUniversal’s Summer Press Day 2018 at the Universal Studios Backlot on May 2, 2018, in Universal City, Calif.
On Sunday, Dateline will air Holt’s exclusive interview with rapper Meek Mill, his first interview since being released from prison last week. “Dreams and Nightmares: The Meek Mill Story” will explore the many controversies surrounding the criminal-justice system, including the parole system, possible wrongful convictions, challenges faced by law enforcement, alleged police abuse, and the disadvantages of growing up poor and black in America. Holt said that he began following Meek’s story after Jay-Z did an op-ed in the New York Times about him and the plight of other men of color who are trapped in the criminal-justice system. While Meek was in jail, Holt was able to speak with him by telephone. On the day of Meek’s release, Holt and his camera crew were outside the prison. They accompanied him on the helicopter and went to the Philadelphia 76ers game. Within that same 24-hour period, Meek sat down with Holt and gave him an in-depth, exclusive interview. “He’s a mature, thoughtful young man. I think that a lot of people who don’t know his work may have preconceived notions about what a rapper is like. I think they may be surprised when they meet him through our broadcast,” Holt said. We certainly face more competitors because everybody with access to the internet is one of our competitors now, and they don’t all necessarily follow the rules of journalism the way we do. Largely, I think it’s safe to say that when the new administration came to power, we were all taken aback a little bit by the hostility toward the press, but I’ve come to embrace it—I think most of our colleagues have—that this is our mission. Our mission is to hold the powerful accountable. What we do is one of the pillars of our democracy. I have been particularly gratified that I get stopped on the street on a weekly basis—sometimes multiple times—by people who just thank me. “Thank you for your journalism. Thank you for asking tough questions.” And that’s something in my over 30 years in this job I never heard before. Holt said that he believes that what journalists do is still very important work. “The American public is engaged now, not only politically, but also just in the democracy and the checks and balances, and they are beginning to recognize what a vital role mainstream journalists have,” he said. When asked for his thoughts on the phrase “fake news” that the president likes to throw around so much, Holt said, “There is such a thing as fabricated news. Fabricated news is a story that’s made of nothing, based on no facts. That exists. There is also sloppy news, or sloppy news reporting in which journalists make mistakes. They get it wrong. I think all journalists acknowledge that happens. Fake news, as it’s been weaponized as a word, I think is frivolous and I don’t think really informs. The president made promises to the African-American community about issues of violence in places like Chicago, about bettering the lives of Americans living in poverty, and we as journalists have to hold him accountable on that, along with every other promise. I think the black press holds a unique position in that it is focused on the voices of African Americans, and we are not a monolithic group of individuals, but there are certain parts of our history that are undeniable, and social conditions that are undeniable. And so I think it’s an important time for all of us as journalists to step up, but certainly the African-American press, I think, has to hold our leaders accountable on some of these issues that we cover. We recognize that when people sit down with us [on an evening news broadcast], they generally know the headlines of the day. They know what Kanye West said, they know what happened to the president’s lawyer today, so we’ve got to give them this added value, so we try to look beyond the headline. How does it apply to people’s lives? How does this affect me and my family? My friends? We want to make it relatable. And it is that type of nose for news that led Holt to his interview with Meek Mill. Sunday’s broadcast will feature exclusive footage of Meek’s release—including footage of the rapper flying on the chopper with 76ers co-owner Michael Rubin moments after leaving prison. Holt also speaks with Rubin, as well as with Mill’s mother, Kathy Williams, and his sister Nasheema Williams. Others featured in the interview include Philadelphia District Attorney Larry Krasner, Executive Director of the Equal Justice Initiative Bryan Stevenson and Mill’s lawyers. Holt’s interview with Meek will air Sunday at 7 p.m. EDT on NBC.